Interior paintings really only date from the 14th century, when fully-realized perspectival rooms began to appear as backgrounds to Biblical scenes. These were accurately furnished with painted floors, wall hangings, rugs, furniture, bedding and other articles, giving a large amount of information as to living conditions at different periods, and for various classes of people (although not for the poor). By the 16th century secular interior paintings acted as the background to still life arrangements and various activities – although the rooms depicted often seemed to take precedence over what happened within them. 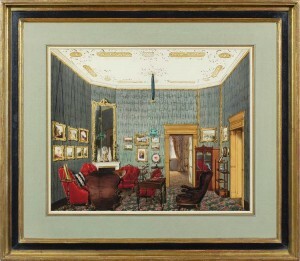 Out of these bourgeois and aristocratic halls, kitchens and chambers, came other minor genres: pictures of state rooms in noble houses (eventually leading to William Henry Pyne’s book of British palace interiors, Royal Residences, in 1819), paintings of art collections (David Teniers’s many versions of Archduke Leopold William’s collection), symbolic backgrounds for moral tales (such as Samuel van Hoogstraten’s or Hogarth’s), and realistic settings for group portraits and conversation pictures (Joseph Highmore, Francis Hayman, &c). 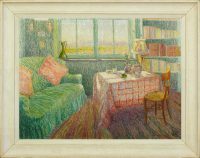 From all of these another subject gradually emerged – the empty interior, so evocative of the lives which inhabit it, of its time and its style. Mark Mitchell’s collection holds both empty and peopled interior paintings for sale. These include Austrian, Scandinavian, Belgian and British works, mainly from the second half of the 19th and the early 20th centuries. 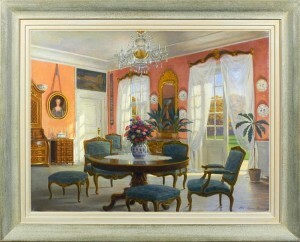 They are usually sun-filled, comfortable, peaceful rooms, intensely welcoming, and endlessly interesting for the spectator: for instance, the work of the Austrian Franz Pitner (1826-92), who painted aristocratic and bourgeois interiors in his native Vienna, or of the Danish Adolf Hansen (1859-1925), who worked in several European countries, and produced both domestic and ecclesiastical interior paintings.